When I saw sneak peeks of Rouge Bunny Rouge's new release my thoughts were "another neutral palette? Isn't this little late to the party?" I already had Burberry Mocha quad, Viseart Neutral Mattes palette and all RBR matte shadows, so I wasn't too keen on ordering Antigo. After seeing my friend @hello_fafa's recommendation on Instagram my curiosity got the better of me. Thank goodness! 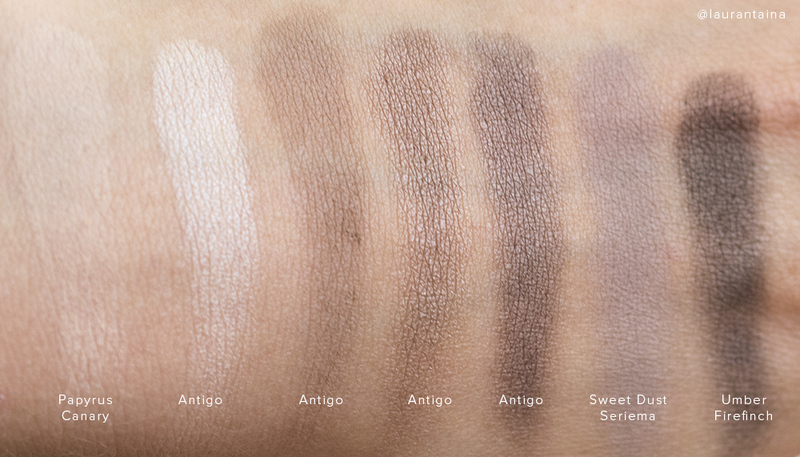 Antigo is a balanced quad with both neutral and cool tones, all four shades in a one big single pan. The palette comes in a big round cardboard packaging, which looks and feels 'expensive'. The compact case itself has a magnetic closure and a decent size mirror. The quad retails 49€ for 7g/ 0.25 oz - which is a great deal as RBR eyeshadow refills are only 2g for 17€. Burberry's Mocha is little more expensive than Antigo and only 5.4g. When I got my hands on the quad I was blown away. I knew RBR makes impeccable powders, especially mattes, but this formula has extraordinary satin-matte finish. 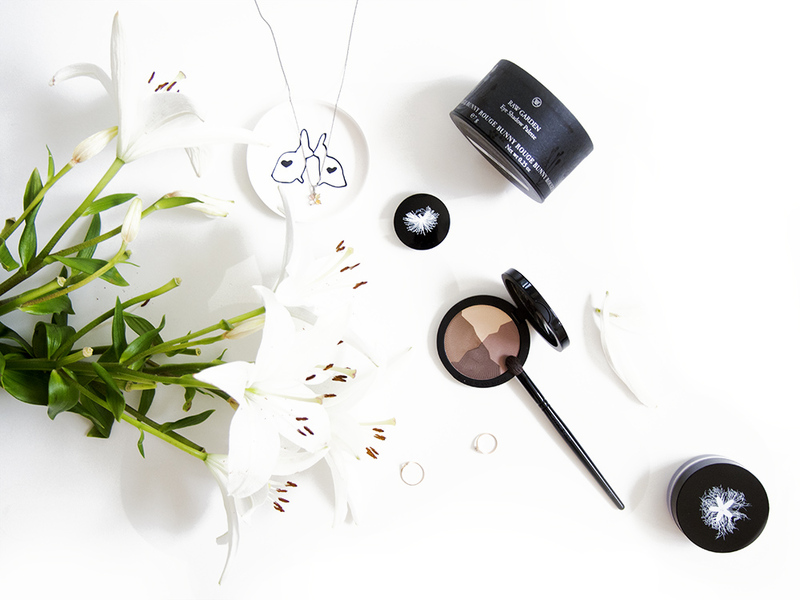 The shadows are enriched with argan oil, but the main ingredient is just talc, also mica and dimethicone are high in the INCI list (complete ingredients are here). In the pan the shadows look plain matte, but on the lid they have a flattering, three dimensional sheen without any glitter or shimmer. When I can get more of this?! I was afraid the beautiful zigzag embossment would be ruined right away, but this how the palette looks after serval uses. I'm not bothered by the one big pan at all, it's very easy to pick up the shade you want or mix them together. The texture is lightweight, silky and feels natural on the skin. 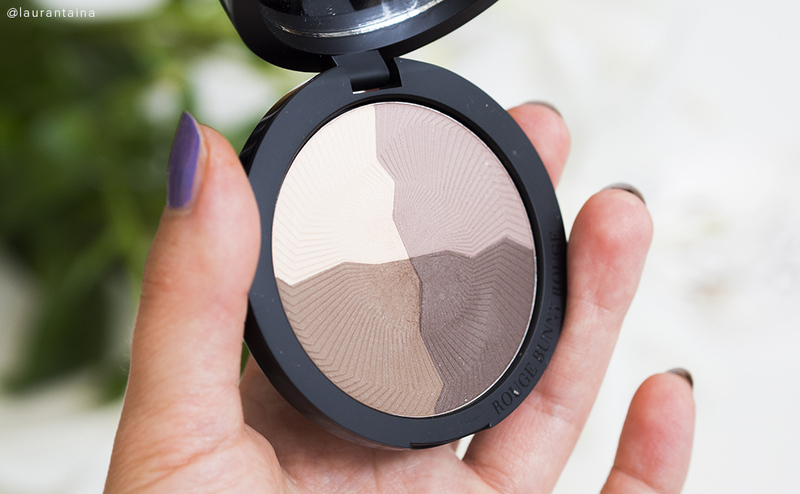 Smooth, almost buttery soft shadows blend effortlessly. There's no fallout but the shadows are so soft and pigmented that I recommend being gentle when you pick up the colors to avoid any excess powder. - Creamy white vanilla with a hint of yellow; perfect for base or highlight. Thanks to the satin finish it brightens up inner corners without any glitter! So pretty. Shows up my light skin as well. - Taupe brown with a hint of cool rose, very beautiful and unique shade in my collection. - Warm milk chocolate brown, perfect for contouring the crease or all over the lid. - Rich dark cocoa brown to intensify your look, outer corner and lash line for example. This picture was taken in natural light. Unlike I expected, the RBR mattes look nothing like Antigo's colors or texture. For example, Papyrus Canary is a fair beige where as Antigo has a creamy vanilla white. Sweet Dust Seriema is way cooler and Umber Firefinch is darker with a slight shimmer, which is more visible in the direct sunlight photo (below). See how Antigo swatches appear more luminous and less 'flat' like the other mattes and Umber Firefinch? This picture makes my heart sing. I wish they would come out with singles in this texture! The satin-mattes add little special something to a neutral eye. I think you can create a beautiful, interesting look without any added pop of color or shimmer (unless you want to, of course). With little primer the shadows last on me the whole 12h day without fading or creasing. Even when my foundation has worn off, the eyeshadows look good. Here's a simple daytime look wearing the palette. I have the vanilla as a base and inner corner highlight, the rosy taupe all over the lid, milk chocolate in the crease and deep cocoa brown in the outer V.
Rouge Bunny Rouge Raw Garden: Antigo palette stands out from other neutral palettes with its impressive pigmentation, sublime finish and gorgeous design. 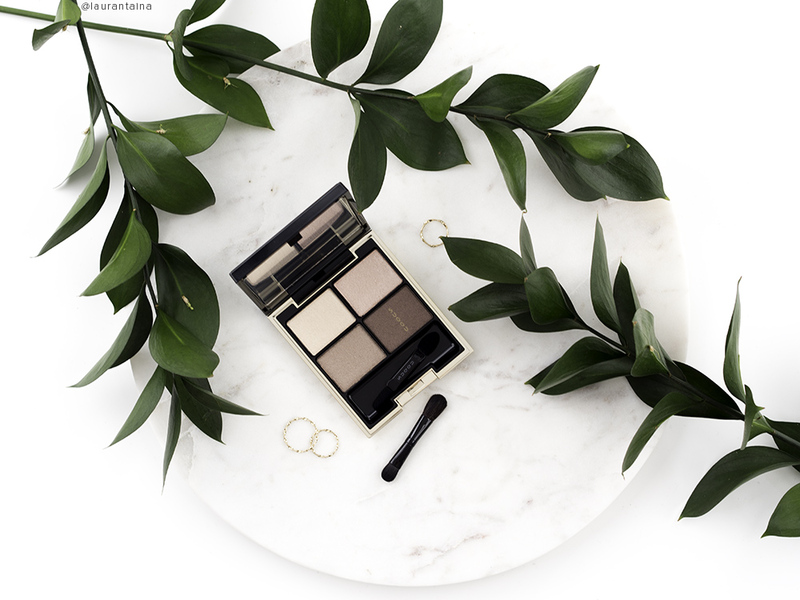 Close to a perfect palette, certainly a must-have for any neutral lover. Huge love! Using the code RBR-LAURALOUKOLA20 on your shopping bag you get 20% off your order! I am no way affiliated and gain no commission for promoting this code. 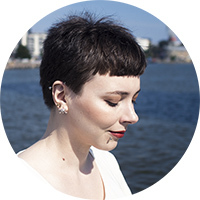 I just want my readers to try out the brand I love so much! Antigo palette would be my pick if you're trying out RBR for the first time. Have a gorgeous day!